You can now more quickly view and update all your security credentials from one place using the “My Security Credentials” page in the AWS Management Console. 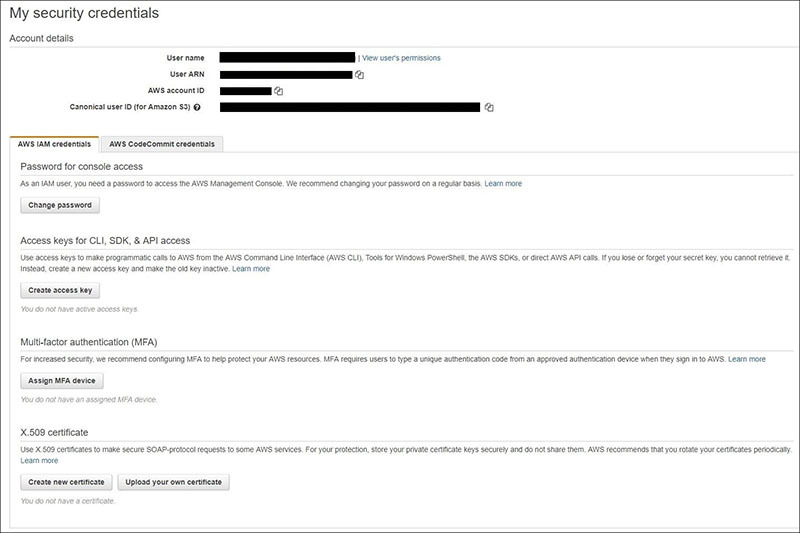 When you grant your developers programmatic access or AWS Management Console access, they receive credentials, such as a password or access keys, to access AWS resources. For example, creating users in AWS Identity and Access Management (IAM) generates long-term credentials for your developers. Understanding how to use these credentials can be confusing, especially for people who are new to AWS; developers often end up reaching out to their administrators for guidance about using their credentials. Today, we’ve updated the My Security Credentials page to help developers discover, create, or modify security credentials for their IAM users on their own. This includes passwords to access the AWS console, access keys for programmatic AWS access, and multi-factor authentication (MFA) devices. By making it easier to discover and learn about AWS security credentials, developers can get started with AWS more quickly. If you need to create IAM users, you can use the My Security Credentials page to manage long-term credentials. However, as a best practice, AWS recommends relying on temporary credentials using federation when accessing AWS accounts. Federation enables you to use your existing identity provider to access AWS. You can also use AWS Single Sign-On (SSO) to manage your identities and their access to multiple AWS accounts and business applications centrally. In this post, I review the IAM user experience in the AWS Management Console for retrieving and configuring security credentials. When you interact with AWS, you need security credentials to verify who you are and whether you have permissions to access the resources that you’re requesting. For example, you need a user name and password to sign in to the AWS Management Console, and you need access keys to make programmatic calls to AWS API operations. To access and manage your security credentials, sign into your AWS console as an IAM user, then navigate to your user name in the upper right section of the navigation bar. From the drop-down menu, select My Security Credentials, as shown in Figure 1. The My Security Credentials page includes all your security credentials. As an IAM user, you should navigate to this central location (Figure 2) to manage all your credentials. Next, I’ll show you how IAM users can make changes to their AWS console access password, generate access keys, configure MFA devices, and set AWS CodeCommit credentials using the My Security Credentials page. To change your password, navigate to the My Security Credentials page and, under the Password for console access section, select Change password. In this section, you can also see how old your current password is. In the example in Figure 3, my password is 121 days old. This information can help you determine whether you need to change your password. Based on AWS best practices, I need to update mine. To update your password, select the Change password button. Based on the permissions assigned to your IAM user, you might not see the password requirements set by your admin. 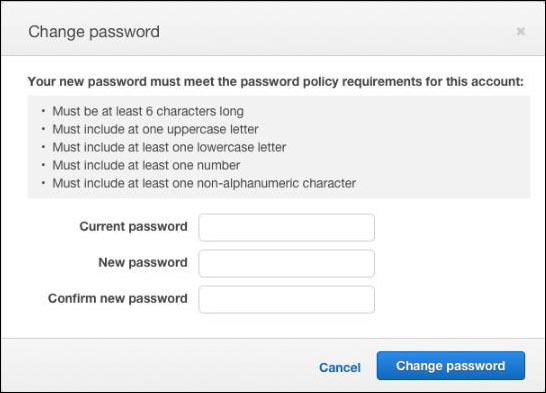 The image below shows the password requirements that my administrator has set for my AWS account. I can see the password requirements since my IAM user has access to view the password policy. Once you select Change password and the password meets all the requirements, your IAM user’s password will update. An access key ID and secret access key are required to sign requests that you make using the AWS Command Line, the AWS SDKs, or direct API calls. If you have created an access key previously, you might have forgotten to save the secret key. 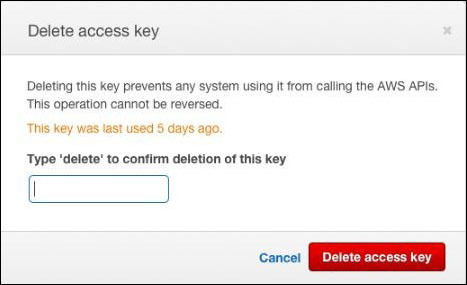 In such cases, AWS recommends deleting the existing access key and creating a new one. You can create new access keys from the My Security Credentials page. To create a new key, select the Create access key button. This generates a new secret access key. This is the only time you can view or download the secret access key. 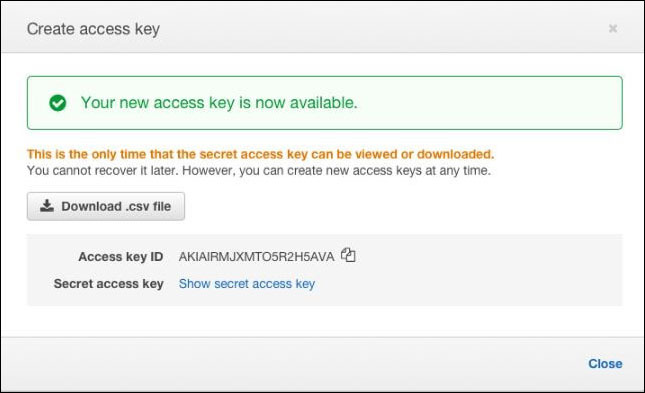 As a security best practice, AWS does not allow retrieval of a secret access key after its initial creation. Next, select the Download .csv file button (shown in the image below) and save this file in a secure location only accessible to you. Note: If you already have the maximum of two access keys—active or inactive—you must delete one before creating a new key. If you have a reason to believe someone has access to your access and secret keys, then you need to delete them immediately and create new ones. To delete your existing key, you can select Delete next to your access key ID, as shown below. You can learn more about the best practices by visiting best practices to manage access keys. The Delete access key dialog now shows you the last time your key was used. This information is critical to helping you understand if an existing system is using the access key, and if deleting the key will break something. As a best practice, AWS recommends enabling multi-factor authentication (MFA) on all IAM users. MFA adds an extra layer of security because it requires users to provide unique authentication from an AWS-supported MFA mechanism in addition to their sign-in credentials when they access AWS. Now, IAM users can assign or view their current MFA settings through the My Security Credentials page. To learn about MFA support in AWS and about configuring MFA devices for an IAM user, please visit Enabling MFA Devices. 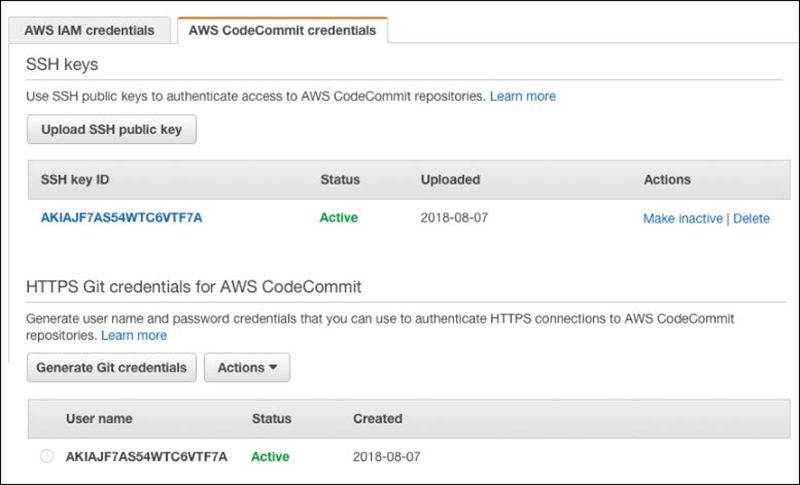 The My Security Credentials page lets you configure Git credentials for AWS CodeCommit, a version control service for privately storing and managing assets such as documents and source code in the cloud. Additionally, to access the CodeCommit repositories without installing CLI, you can set up SSH connection by uploading the SSH public key on the My Security Credentials page, as shown below. To learn more about AWS CodeCommit and the different configuration options, visit the AWS CodeCommit User Guide. The My Security Credentials page for IAM users makes it easier to manage and configure security credentials to help developers get up and running in AWS more quickly. To learn more about the security credentials and best practices, read the Identity and Access Management documentation.